Celebrate your child’s birthday in the woods! The AEP Nature Explore Classroom offers a great place for a birthday party. Trees Indiana will create a memorable party experience that includes 2 hours of playing games, singing songs and exploring nature. 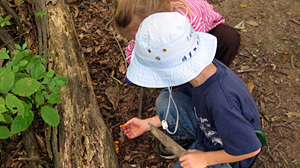 A qualified Nature Explore educator will lead the activities for up to 12 children. You are responsible for supplying the birthday cake and serve-ware, we’ll supply the fun! Interested in getting your school or organization involved in a nature-related event? Trees Indiana assists schools and organizations in creating nature-related activities that vary from one-day, one- time occurrences to repeat activities or permanent fixtures. We can help you plant a tree, plan a Nature Event or just visit your site and give you some ideas about ways your organization can easily participate in becoming environmentally aware. The ideas for this are endless!